The Federal Reserve is still waiting for the right moment. In a decision that could have gone either way, the Fed decided not to raise its key interest rate in September. America's central bank hasn't raised rates in almost a decade and rates have been stuck near zero since the depths of the financial crisis in December 2008. Concerns about a global economic slowdown, low inflation in the U.S. and volatile stock markets lowered the chances of a September rate hike. "The situation abroad bears close watching," Fed chair Janet Yellen said at a press conference Thursday. "Heightened concerns about growth in China and other emerging market economies have led to notable volatility in financial markets." The stock market surged after the decision with the Dow rising over 150 points, but then it fell back to flat as it appeared to sink in to investors that a rate increase is likely coming. Although they didn't raise rates now, the majority of Fed committee members believe there will be a rate hike in 2015, according to its economic projections. The committee has two remaining meetings this year -- in October and December. "Every meeting is a live meeting," Yellen stressed. October "remains a possibility"
Overall, the Fed does sound slightly more optimistic about the U.S. economy. It raised its expectations for economic growth this year to 2.1% from 1.9%, and it lowered its projection for the unemployment rate by the end of the year to 5%. Currently, unemployment is 5.1%. Yellen emphasized that even though the committee is watching the jitters abroad and in U.S. markets, it has "not fundamentally altered our outlook." Still, it wasn't enough to raise rates in September. "The committee anticipates that it will be appropriate to raise the target range for the federal funds rate when it has seen some further improvement in the labor market," and remains reasonably confident that inflation will pick up, the Fed's committee said. A variety of prominent voices -- from chiefs of the IMF and World Bank to a Nobel Prize-winning economist -- had urged the Fed not to raise rates in September. It's unclear how much of a role those voices played, although protestors stood outside the Fed's meeting spot this week urging them not to raise rates until more people have jobs. Two forces are playing into the Fed rate hike debate: a good-but-not-great U.S. economy and a gloomy economic outlook outside the U.S. The Fed's two primary goals are to help the economy achieve full employment and keep inflation from getting out of hand. Stock market volatility plays into the Fed's decision too, although Yellen tried to downplay the market's impact on central bankers' thinking. 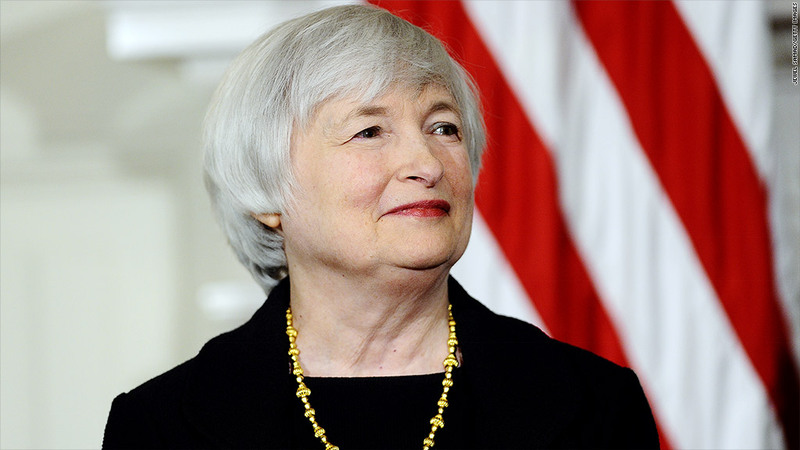 "The Fed should not be responding to the ups and downs of the markets," she said.